Well, we decided on a hike to celebrate the Sunday of Labor Day weekend. The kids, Nina, Ben and Nichole, who came home for Labor Day weekend agreed to go with Audrey and I to Palisades-Kepler State Park, where we hiked along the Cedar Cliff Trail, which winds along the top of a cliff along the Cedar River. The Cedar River looks a bit more like the Cedar Stream, these days. The sandy beaches, a feature of the park, are much bigger than usual. And it was pretty hot and muggy this afternoon. Despite the drought, the woods in the park still had a dark and dank feel to them—it was good to “smell” damp, even if the ground was bone dry. It was a vigorous walks, which took us over an hour. The trail is about 1.3 miles, so we went over 2 and a half miles, up and down pretty steep inclines with very narrow steps, sometimes of cement, sometimes rocks and tree roots. Ben pointed out a millipede on its way. It was about 4 inches long, and seemed huge for the kind of creepy crawly it was. One feature of the trail was the many fungi that grow—there were orange and yellow and grey things growing on the ground and on live or rotting trees. We’ve been to this park several times, but not for some time. I would like to return again, on some cool fall day, although I’ll then have to be careful not to slip on leaves. I hope when I next see this fine park, it won’t be too long from now and there will be a lot more water in the river! There’s a Fungus Among Us, And Catalpa Kaput! Our wet warm weather is taking a bit of a toll. The larger of the two Catalpa’s is giving up the ghost. I’ll give it a little time—after all, if I decide to remove and replant, it will be next spring before I can hope to sprout a Catalpa again, anyway. Its sister tree in the nearby garden is sick, but not dead yet—so there’s a hope I can merely transplant and not go back to square one. Meanwhile, stalking the garden stalks—fungus! The pink Crabapple trees, which are the ones most vulnerable to leaf fungus, are showing signs of suffering. It will make the trees less attractive for a time, but these trees have been around for several years and have been attacked before—they can take some punishment from this problem but still be OK. 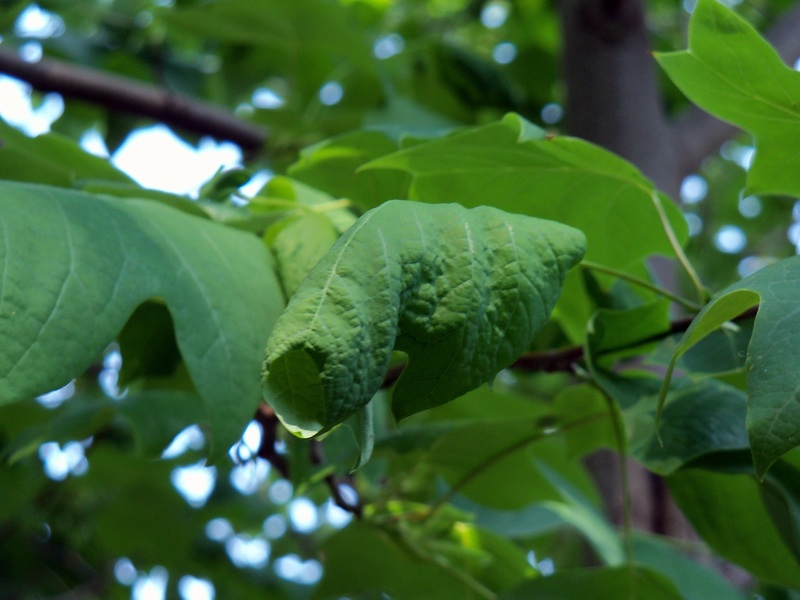 The Tulip Tree, however, worries me. I’m not 100 percent sure what’s wrong with it—many of its leaves appear to have a warty like texture. Clearly, the tree is under attack from something, but I don’t know if it’s a soil fungus or a leaf fungus, or a fungus at all, but I suspect there’s a fungus among us. It’s a fairly young tree, but also fairly large, so I hope it will snap out of it when drier weather sets in. Seems to be a poor year for peonies in my yard. A large white bush, the “father” peony because it was the one that we here when we moved in, didn’t come back this spring. Only two of the “traditional” peonies, both pink, will bloom. One is just now budding, the other, as you can see, is already flowering. Well, an off year is OK, but I need to find some white peonies. And let me know if you know what’s going on with my poor Tulip Tree! Life musings ... My name is Joe Sheller and I'm an Associate Professor at Mount Mercy University in Cedar Rapids, Iowa. This blog is personal opinion and does not reflect the opinion of the university, its administration, staff or board. I love to garden and often find my mind wandering when I'm pondering weeds or flowers. This blog is a pretty random mix of those thoughts, some on gardening, many on life in general. CRgardenJoe's Blog · Random musings of a brown-thumbed gardener.